English Lather... No. It's not a typo. 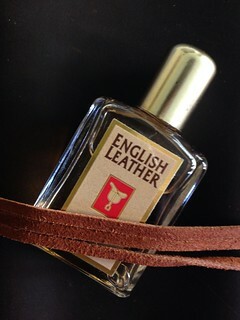 To me English Leather smells more like soap than it smells like leather. And analyzing the notes (again - what I'm smelling, not what the marketing material tells me) makes it bubble-clear why. English Leather opens with suede-like notes of tobacco leaf and ionones, which are reminiscent of violets where they occur naturally. These are mingled with plenty of petitgrain, which soon enough takes over. Therefore, the leathery association end pretty quickly. The reason is not only this note's inherent dominant character; but also because it's more likely the actual material used here is linalyl acetate. Underneath it all there is plenty of coumarin to give it a very powdery-soapy character. It really is more of a fresh tobacco leaf scent than a leather fragrance. Curiously, it brings to mind another violetty masculine classic, Geoffry Beene's Grey Flannel, a scent that is only one year my senior. As far as violetty masculines scents go, I find Grey Flannel cloying and overpowering, and am much more fond of English Leather. As far as tobacco-leaf fragrances, I much prefer my very own Sabotage. And as far as cheap classic drugstore scents, so far Tabac Original and Old Spice (which is next up on my to-review list) are both unsurpassable. I don't know how English leather is supposed to smell, but I was thinking about saddle leather more than suede gloves. I have expected to be transported to the tack-room, but instead was sent straight to the shower for a scrub before I even got a chance to get dirty at all... I have a feeling its formula got scrubbed a bit since it was first created in 1949. "Wear English Leather or wear nothing at all", says the box of the Soap-on-a-rope. So let's move over to English Leather's Soap-on-a-Rope. That's a triple-milled white soap, stamped with the stirrup and accessorized with a white rope handle, in a sizeable length, enough to bring to mind Hitchcock's film. I am not certain what the tope is for, so can only guess that either men lose their soap bars quickly; or that they like to hang them to dry on the shower-head. I really did buy this one with someone in mind as a giftee, so I don't want to crack it open completely (plus I'm not particularly fond of milled soaps - and much prefer the artisan cold-processed ones, which can be made in much less drying formulae). I will only comment on the scent and report that it's even more cologne-like and far less reminiscent of leather, suede or anything of the like.